Have preschoolers that really need to get out of the house on a rainy day? Monkey’s Treehouse is a great solution. 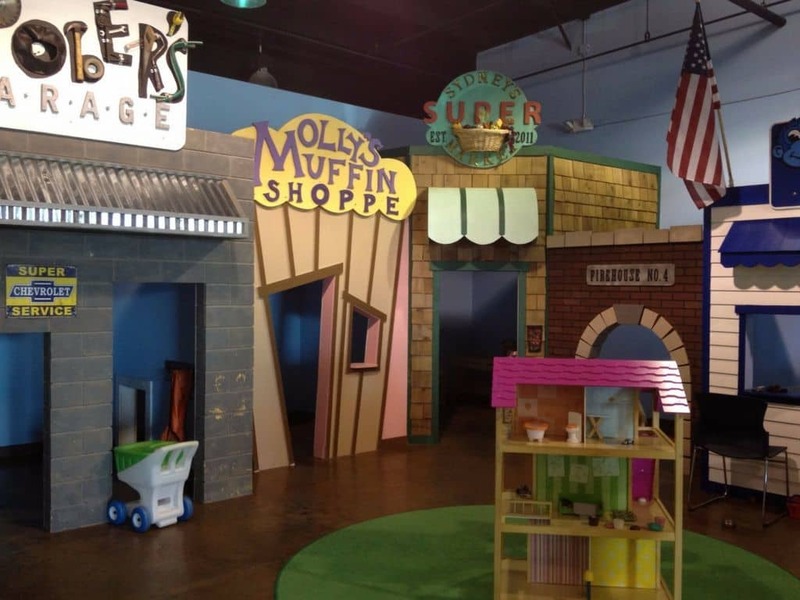 This indoor playground is geared toward younger kids – toddlers and preschoolers. Tamzin (2) loved it. Declan (8) is a bit too old. Monkey’s Treehouse is a wonderland of imaginative play opportunities. 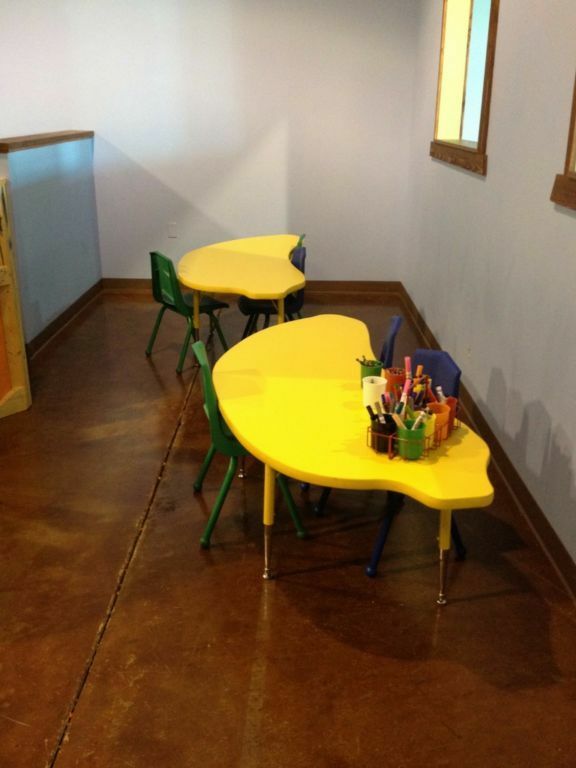 It has large tables at preschool heights with all kinds of things to explore. Have a kid that likes trains? They have you covered! Another who’s first word was Tyrannous Rex? Lots of dinosaur fun too. There are tables of fun throughout the play area. Tamzin was fascinated with the doll house that is taller than she is. It had plenty of dolls and furniture to keep her occupied for quite a while. There is a large play structure with a slide, a tree house and even a hollowed out tree that kids can get in. There are 2 sets of steps to enter the climbing area which made it easy for even the littlest guest to enjoy exploring. On our visit, there was concern from several different parents about the rope ladder. The “rungs” are pretty far apart and, of course, the two and three-year-olds wanted to climb but it was just a bit too big for them. When Tamzin was on the play structure I stood at the bottom of the ladder to ensure she didn’t try to climb down unassisted. I also stood behind her to make sure she did not fall on the ascent. This was the only area in Monkey’s Treehouse where I felt like I had to supervise Tamzin closely. Have a child who is tired of running around? Check out the art tables. There was plenty of paper, markers, and crayons for kids to take a break and get their creative juices flowing. This area is also separated by a half height wall so kids are not interrupted as they create. And if that is not enough – there is an entire imaginative play town in the back corner. This included a garage, complete with ride-on cars and a work bench, a muffin shop with a full kitchen set up and a grocery store with plastic food, a shopping cart, and a cash register. There is also a fire station and post office too. In addition to open play time, Monkey’s Treehouse offers classes and activities that typically are included with a paid admission (call for a schedule or check calendar here) and birthday parties. Cost: $9/child for each child up to to 8 years of age. Although my grandson thoroughly loves going there, after 4 visits over the last several months, I am compelled to document MY observations. On three of our four visits, there was only one employee present and her job was to primarily work the front desk. I witnessed her going outside to smoke, vape or whatever every 15 minutes, during these breaks, NO employee is actually inside the business and I did not observe any safety/security camera monitoring/recording. On our 4 and last visit, an employee or owner had a German Shepard puppy (on leash) mingling in close proximity with the toddlers. As a Gpa, I do not want any dog close to my Gson or present where food/drink is served. Finally, the walls, floors, rest rooms, play stations/equipment, toy cars/trains/stuffed animals are in dire need of “DEEP CLEANING”.